Sarah Ahearn Bellemare is an artist from New England who first began painting as a way to illustrate poetry. Her mixed media paintings are layered with found images, fragments of text from old books and pieces of outdated maps. The ephemera become the fabric and focus of her paintings, many of which are inspired by childhood memories of time spent by the seashore. Sarah has taught art to many students in a variety of settings ranging from art camps to museums, teaching students age 3 to 63. 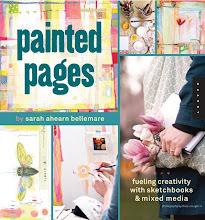 Most recently, Sarah has taught her playful techniques for making mixed media paintings in her popular online workshops : Painted Pages Workshop and Color Pattern Paint. Sarah's book, Painted Pages: Fueling Creativity Through Sketchbooks and Mixed Media was published by Quarry Books in May of 2011. She can often be found making messes in her sunny home studio in Western Massachusetts. When she’s not creating, she’s dreaming up new adventures that she’ll take with her ecologist husband, their precocious (yet adorable) little girls and their lovable (but odd) mutt Chooch the pooch. 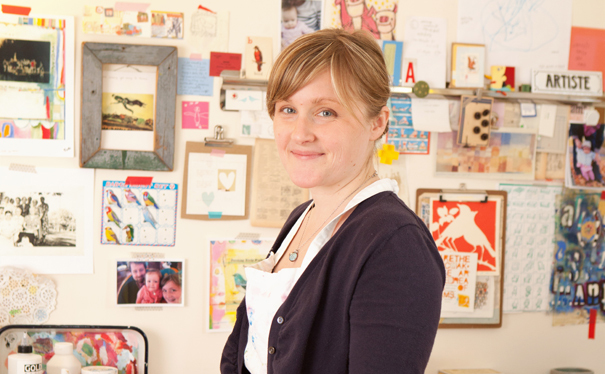 Follow Sarah on Instagram to see peeks into her day-to-day life as mama/artist. It's always busy! Find here @sarahearn on Instagram.